Ryukoku University is situated in the south-east of Kyoto City, and conveniently located only a few minutes away from Kyoto Station. Station: The closest station is Fukakusa station on the Keihan line. Please note that it is a “local” station, in the sense that express trains do not stop there. 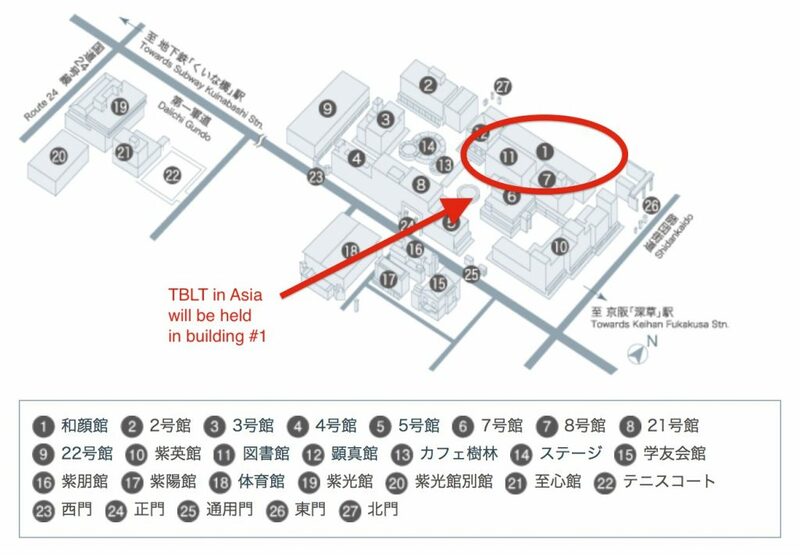 Conference attendees traveling from Osaka will need to change to a local train at Tambabashi station. Those traveling from northern Kyoto will need to change to a local train at Sanjo station. Fukakusa station is a three minute walk from the Wagenkan. On the subway line, Kuinabashi station is a ten minute walk from the campus and then a nine minute ride from there to Kyoto Station. Alternatively, and convenient for those staying in Nara, or for those wishing to stop at the wonderful Fusimi Inari Taisha, the JR Nara line also runs close to the university. The closest station is JR Inari which is a ten minute walk from the university. Again, this is a “local” station, so make sure that you change trains at Rokujizo if coming from Nara, or take a “local” train direct from Kyoto. It only takes five mins from Inari to JR Kyoto station.